In this form Durga is four-armed and she carries a sword, shield and lotus. One hand is depicted as giving blessing. She rides a lion. Mother Kaatyaayani is worshipped as the sixth manifestation of Goddess Durga. She is adored on the sixth day of the Navaratri. The world-renowned sage Kaatyaayana was born in the dynasty of sage Kaatya. He was an excellent devotee of Goddess Durga and performed an austere penance for many years to propitiate her. Being delighted by his devotion, Goddess Durga appeared before him and asked him to demand the desired boon. Thereupon the great Sage Kaatyaayana demanded that she should be born as a daughter to him. Goddess Durga granted his wish. Goddess Durga’s sixth manifestation appeared as a daughter to sage Kaatyaayana. She came to be known as ‘Kaatyaayani’ as she was the daughter of Sage Kaatyaayana. As soon as Mother Kaatyaayani was born, she assumed a huge and massive form. Seeing her Universal Form, sage Kaatyaayana bowed to her with great reverence and adored and worshipped her for three days from the Bright seventh to ninth. Having accepted the adoration and worship of the sage, Mother Kaatyaayani assassinated demon Mahishasur. Mother Kaatyaayani can give everything to her devotees. The gopis of Braja too worshipped her on the banks of the Yamuna in order to beget Lord Krishna as their husband. 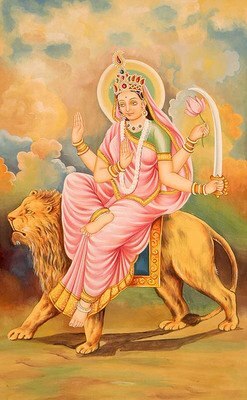 The four-armed Mother Kaatyaayani rides the Lion. She is easily propitiated by devotion and destroys all sins of her devotees. Her worship is conducive to Dharma, wealth, pleasures and salvation.